Project Alicia : He did it! 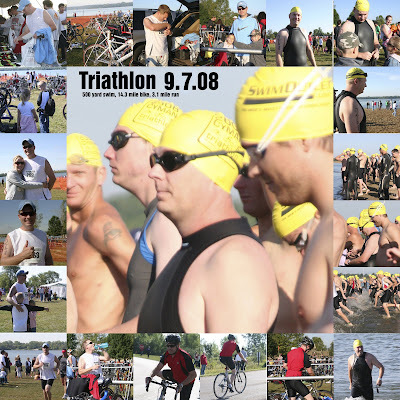 Haldan did his FIRST sprint Triathlon at Big Creek State Park in Polk City, IA (near Des Moines) on September 7, 2008... what an amazing feat! There was a 40% chance of rain, but luckily the day stayed clear for us. Unfortunately we've been experiencing a bit of a cooler spell, so it was only 50 degrees when we arrived. It was an early morning. We stayed over in Ankeny in a hotel and got up a little after 5AM so we could all get ready, have breakfast, and get to the lake by 7AM (it was about a half hour drive from the hotel). Haldan had to get everything set up and get his number marked,etc. Haldan's swim was first, so he was really glad he had decided to buy that wet suit acouple days before. It was money well spent. By the time his wave went (male 25-34 years)at 9:15 it was still only about 55 degrees. The lake water was a little warmer, but not much. Luckily as the day went on it warmed up to a high 68 or so. He was able to do the 500 yard swim in about 10 minutes and then transitioned to the bike. He had a hard time getting dressed, as he was feeling a little dizzy after the swim. He powered through and got out on the bike for his 14.3 mile ride. I must admit it was a bit tricky trying to entertain the kids and get pictures. We underestimated the time for the bike so we waited about 20 minutes and by the time Haldan came in Camille had wandered off and was no where to be found as I was trying to get pictures of Haldan transitioning. Then he was off for his last leg, the 5K (3.1 mile run). Camille was found and we spent some time at the park until closer to the time we would need to wait for him to finish. There were a few things not in my favor. I didn't have a watch, didn't know exactly how long the run would take him, couldn't get the kids to leave the park, and then I didn't know exactly where they would finish (as I was told it would be a different location than it was). To make a long story short, I missed the finale! I couldn't believe it. We raced over to the finish line as Haldan was walking toward us. We had missed him by a minute or so. I was pretty disappointed, after all that is the crowning moment, the moment I was waiting for all day, the entire reason I came, and I wasn't there. It made me feel even worse when he told me he was looking everywhere for us and didn't see us. I've beat myself up about it all day and there is nothing more I can do, so what's done is done and that's all I can say. I missed the finish. I guess I've learned a few things for next time, which by the way, Haldan has already started talking about. After it was over he said he even had a little energy left and that maybe he could have pushed himself harder. I think his time was 1 hour and 35 minutes total. I couldn't be more proud! It's an amazing accomplishment for anyone, especially someone who has never done this before, has never been much into fitness, and is 34 years old. He has truly inspired me. Good job Haldan!! Sounds like you guys had fun though! Sorry that Camille got lost! I'm sorry you missed the finale too! That really stinks! Way to go, bro! I'm impressed. Way to push yourself and achieve your goal. Congrats!